4) 10 minutes to Turtle Creek casino. 7) Nice , clean outdoor Hot Tub to soak in. 10) Home of the dogsled races/ white pine stampede/ and many outdoor weekend activities. 4) Bicycle trails !! Even in Traverse and Petoskey! 8) Grill on our shaded party deck and soak in our fresh, Hot Tub! 9) Bring your whole family! Plug in the camper! 1) Experience the famous Torch Lake experience!! 2) Sunbasking or partying on the gigantic Sand Bar. 3) Rent our affordably priced large pontoon !! 5) Bring All your FRIENDS or FAMILY!! 6) Count the star constellations from our Hot Tub!! 8) Gather around our fire pit & laugh about the day! 10) Party or dine at the famous areas restaurants! 1) Quiet Solitude and walks with no close neighbors! 8) Wine tours & Hot Air balloon rides!! How long has it been since you counted the constellations on a clear, bright starry night while relaxing in a hot tub? Or listened to the howls of coyotes in a distance or seen a family of wild turkey strolling by? Isn't it time you and your loved ones escape out of the city lights and come up to our northern lights for an extended weekend or even for a week long break. Our log chalet is cozy enough for honeymooners or couple retreats, (we have many) yet large enough for family and friends! Being off the water may not be your first choice, but our guests say it is their best choice. They say to us why spend the beach front $$$ on Torch Lake when we can affordably have everything here and more like a pontoon or a dock space, privacy, wide expansive sunsets, a clean and bubbly hot tub under the starry night, wildlife, many walking trails and views in wide open and wooded acreage. Bring your boat to our private dock, or rent our pontoon and spend the day basking under the famous Torch Lake Sandbar!!! Our log chalet with our large party deck, is large enough for families and friends but cozy and romantic enough for couples. Our log chalet overlooks magnificent sunsets and tree tops views from a spacious shaded deck. Many 5 star reviews best describe this log chalet rental on 140 private acres during all 4 seasons! Nestled in the hills near the south end of the beautiful clean waters of Torch Lake we offer privacy, comfort, and great memories!! Our Number one Attraction is the World's Third Most Beautiful Lake, TORCH LAKE and our Famous Sandbar!! We are 10 minutes from Turtle Creek Casino and 20 minutes from Traverse City with Meijers shopping between the two. We are a day's outing to the most popular ski resorts, Sleeping Bear Dunes, or the Big Mac Bridge and Mackinac Island. Traverse City and the Turtle Creek Casino is 10-20 minutes away. Winter time is fun in the Pure Michigan snow! Close to Traverse City and all the ski resorts, cross country skiing, festivals, specialty restaurants, snow sledding, ice fishing. All winter sports near by! Plus, come back to the chalet, go snow shoeing on our property and soak under the stars in our sparkling clean hot tub! Catch Spring fever here and make it last until summer! Wild flowers, mushroom hunters, stream and lake fishing. Rent our boat. Come back to our fresh and clean outdoor hot tub and count how many constellations you can see. Summer is full of life here! Why pay the high price of shoreline rent when we have the perfect spot for Torch Lake fun plus a nice pontoon to rent or a boat dock for your own boat!! IMAGINE, laying out in the blazing sun on the famous Torch Lake Sandbar by day and counting the stars from our fresh clean hot tub by night. We can sleep up to 9 in beds. Never run out of hot water with our state of the art hot water system. Honeymoons, Reunions, Family Get-a-ways! 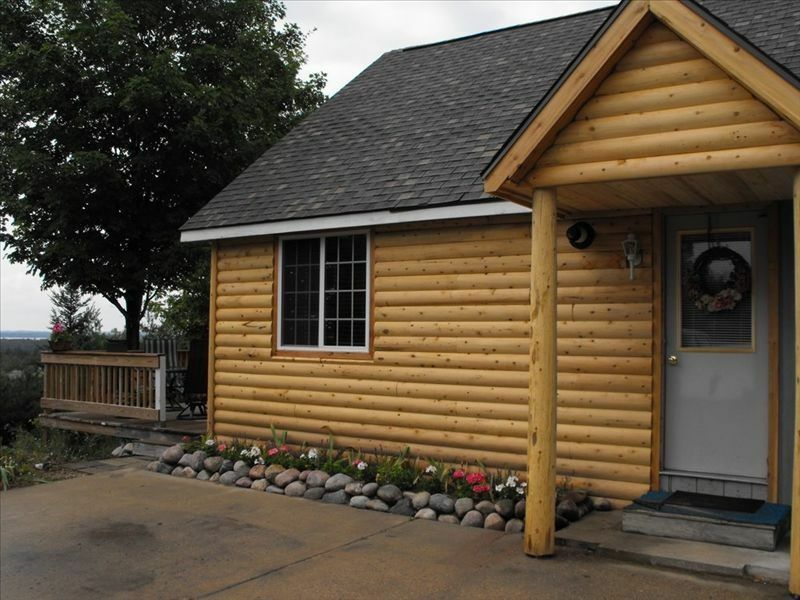 Our log chalet's hillside setting is the prettiest and most peaceful vacation rental in the south Torch Lake area. All year long, the Torch Lake/ Traverse City area is buzzing with events, festivals, concerts, restaurants, wineries,and shopping! Our detailed cabin is furnished with all the necessities inside including quality cookware, linens and towels! You will never run out of hot water for showers because we have an on demand hot water heater. We clean the hot tub and its filters between each renter and fill it will hot water before you arrive. We also include fire wood to roast those marshmellows while watching the panoramic sunsets from our cedar swing! You can rent our pontoon for the day for fishing, playing, or relaxing on the famous Torch Lake sandbar by taking advantage of our multiple day pontoon discounts or dock your own boat at a rented dock space just 5 minutes away. On our property, there are many walking trails and places to sit to take in the views or engage in conversation with your friends. We have even provided a space just for sun bathing or book reading. We hope you will consider coming to our secluded chalet with a view. We have many return visitors...check out our reviews! Come to Torch Lake, stay and play! Thanks for reading. God Bless! We are a hard working family who love this property and didn't want it developed so we purchased it and are renting to pay for it. If you are looking for relaxation or beautiful seclusion.... This is it. It is 5 minutes off the highway and no close neighbors! Full size tub with massaging shower head. Unlimited, on demand hot water heater. Never have to wait for hot water. It's always there! Nice and Clean sink, hair dryer, liquid and bar soap, towels and wash clothes, One toilet paper roll for each day you are there. All provided! The little villages of Rapid City and Alden provide ice cream/ speciality shops with several restaurants. From our large deck and from our hottub, you can see Skegemog Lake which connects to Torch Lake via Torch River. From other site on the property you can see beautiful Torch Lake. A Dock is provided free of charge. It is at a local marina. You can park your car in front of your boat or rent our pontoon for your stay. A perfect way to play on our famous Torch Lake sandbar! Yes!, Central air conditioning or just open the windows and let the nice summer breeze come in off the lakes! We have provided 100% high quality cotton linens for great night's sleep. They are so nice that customers call me occasionally asking where I have bought them. Stacked washer and dryer with laundry soap/ softener/ beach/ect..... Iron and ironing board, vacumn and hose to clean your car, if you want. Electric dryer on top of washer. Softening paper included. Outdoor clothes line is there also. WE just added an electric fire place for your comfort and enjoyment. It helps set that relaxed feeling you are looking for when on vacation. It even provides heat when you want it to. 2 large parking areas, one for 2 cars/trucks. The other is large enough to park more cars or your boat/ ATVs/ or toys. All towels and wash/hand towels are provided. If you run out you may wash them. We provide the laundry soap! The full sized refrigerator& freezer is cleaned after every renter. We have a smooth glass cooktop electric stove with a full size oven. A full size oven under the cook top. Cookie sheets, pizza pan cake pans are all cleaned and ready for use. Microwave is cleaned after each renter. A full set of dishes and flat ware. Clean, complete kitchen with fine cookware and utensils! We believe we have added everything included a blender, coffee pot, toaster, even a crock pot. We have steak knives & cutting knives. Television is digital with flat screen. .
You will need to bring your toys and outdoor sports games. Our large deck over looks lakes and tree tops. Kayak/ Canoes available to rent. Lowest rates. 24 foot pontoon available for extra charge or a fishing boat for your early morning excursions. Boat dock at local marina for your boat which is included in our price of cabin rental. 6 rocking, swivel chairs with matching round table and 2 matching chairs. We also have a cedar picnic table/ cedar swing and metal chairs down by the firepit with the panoramic sunset. Pull the kids on our ski tube with the pontoon, or rent water tubes from us and flow down our 'Rapid River' along our beautiful Freedom Park. It was fun when we were kids and many do it still. Plenty of places to snowshoe or cross country ski on the property. Many golf courses within 20 miles. seats 4 with new ozonator Cleaned and water replaced after each renter. Hot tub 4 lounge chairs for laying out in the sun. All very private with great views. Absolutely the most awesome rental in the area if you like a relaxing hot tub, views/ privacy/ acreage. The first thing we noticed was how clean the place was. We only used one of the bedrooms and the mattress was very comfortable. The best part was the hot tub. It was very clean and warm and we enjoyed watching the sunset while in it. It’s very quiet here and peaceful. They have all the basics to cook as we wanted to do that here. When we were looking for a baking sheet they didn’t have one and Dale had her husband drive up and give us one. That was very nice. They communicated great and we’re more than happy to accommodate us. The electric fireplace was a nice touch. Couldn’t have asked for a better place to stay, the chalet was great. Rented for a Valentine’s Day getaway, We arrived from southeast Michigan on a Friday evening and utilized the full kitchen and cooked wonderful spaghetti dinner, enjoyed a few drinks as well as used the hot tub. Come Saturday, we spent the day in traverse city (only a 20-25) minute ride, checked out local shops, sampled some wines at cherry republic, and sampled some whiskey and bourbon at grand traverse distillery, we ate at Mr. C’s pub which was reasonable, then ended up at turtle creek casino. I highly recommend staying here if you’re looking for a small place in the middle of the woods close to torch lake and traverse city. We had a slight issue with the hot water, but Dale sent mike out right away and everything was better after that. I would definitely stay here again! Cabin was very nice. Enjoyed the hot tub and bon fires at night. Gorgeous property. The hiking was fantastic!! The chalet was impeccably clean and the hot tub was a blast, even in the winter. The kids loved playing in the snow and exploring the property! The owners were as nice as could be and made everything really easy, would stay again! Read our reviews!! Boat Dock included!! Pontoon rental available. Secluded Get-a-way on 140 acres! 20 minutes from Traverse City and 3 minutes from the Famous Torch Lake Sandbar with boat space at a local marina!! 4 season vacation rental with fresh and clean HOT TUB and a sleep number bed!!! Book now. Ideal for Honeymoons, anniversaries, family & friends. No neighbors, just wildlife with unending panoramic views of Northern Michigan's finest. Natural setting overlooking hills, forests, and lakes with amazing, blazing sunsets and wildlife trails! Don't forget to Read our reviews! Winter Fun! Centered in the middle of Northwest Michigan skiing, sight seeing, casino fun, ice-fishing, snowmobiling and hunting this cozy log chalet is perfectly ready for 1-9 people including an sparkling clean outdoor hot tub overlooking views and sunsets. .all bed and bath linens, a well-equipped kitchen, and plenty of stars constellations at night from the large deck. Just cuddle up in a blanket around a campfire on the cedar swing and catch up on conversations while being isolated from life's busy distractions. We would love to have you experience PURE Michigan views from our neck of the woods.